Bharti Airtel has just announced its audited consolidated results for the first quarter of current fiscal ended June 30, 2018. It’s a good quarter for Airtel as it completed the acquisition of Telenor India, which took the company’ subscriber base to 344 million. The Gross ARPU on the network is down to Rs 105 from Rs 116 it reported at the end of March quarter. The customer base of Airtel across 16 countries stands at 457 million, which is up by 21.2% YoY. Speaking about the company’s revenues in India, it’s down by 7% YoY to Rs 14,930 crore. The telco’s EBITDA is down by 24.1% from Rs 6,475 crore in Q1 FY18 to Rs 4,913 crore in Q1 FY19. The EBITDA margin was down by 4.6% from 37.5% to 32.9% a year ago. 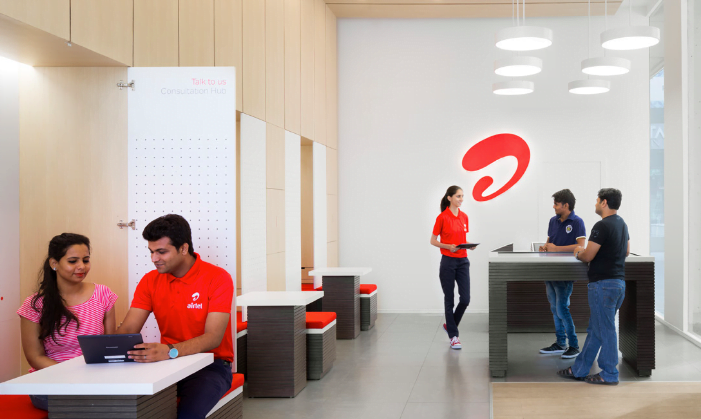 During Q1 FY19, Airtel completed the acquisition of Telenor India, and the subscriber base got a major boost. The mobile data traffic on Airtel network has grown 4X to 2151 Billion MB from 472 Billion MB in Q1 FY18. During the quarter, mobile voice traffic has grown by 62% from 422 Billion minutes a year ago to 684 Billion minutes in Q1 FY19. “Mobile segment continues to be impacted by aggressive industry pricing and has witnessed YoY de-growth of 11.0%,” said Airtel in a press statement. The leading telecom operator also revealed that mobile broadband customers increased by 75.2% to 85.7 Million from 48.9 Million in the corresponding quarter last year. While the mobile business of Airtel in India remained still, it registered a healthy growth of 10.6% in Digital TV Business and 11.8% in Airtel Business on an underlying basis. 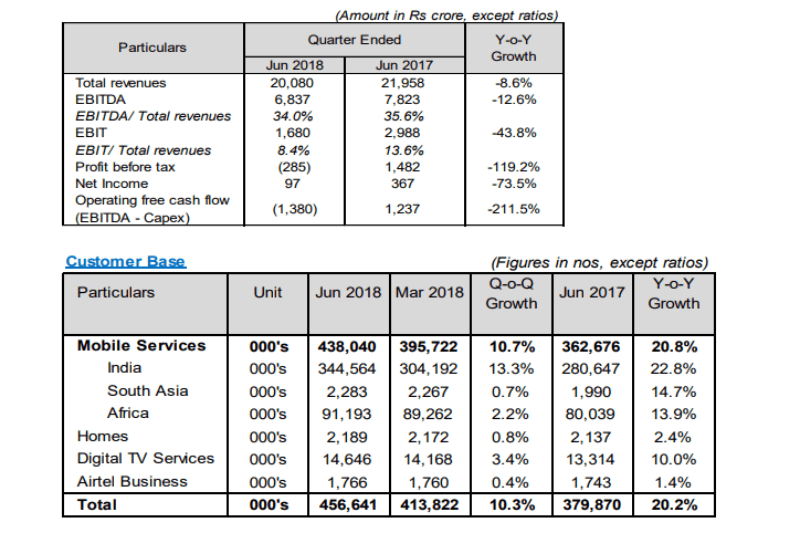 Speaking about Airtel’s Africa unit, revenues grew by 13.9% YoY led by strong growth in data and Airtel money transaction value. Mobile data traffic has grown by 75% to 78 Billion MBs in the quarter as compared to 44 Billion MBs in the same quarter last year. Data customers increased by 45.2% to 26.4 Million from 18.2 Million in the corresponding quarter last year.